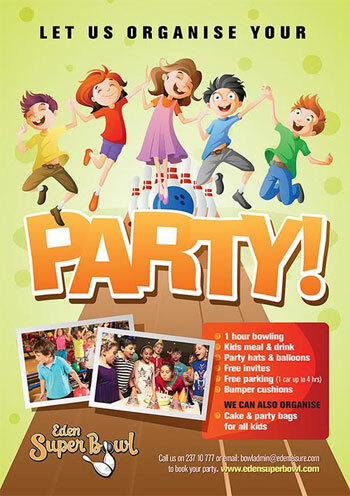 Organise your Kids' parties at the Eden SuperBowl to really give them a day to remember ! Our special Party Package means your kids and their friends will bowl for a whole hour, enjoy a delicious meal including the drink of their choice, and share a scrumptious Cake to complete the celebration. Our 'Bumper Bowling' system means extra fun and not too many of those unlucky 'Gutter Balls' for your little ones, while on-screen cartoon characters pop up between shots to add to the fun. We'll even throw in some party hats & balloons to get the party started.